GREENBURGH (WABC) -- A man accused of driving the wrong way on the Sprain Brook Parkway in Greenburgh and causing an accident that killed an NYPD detective earlier this year was arraigned on manslaughter and other charges Tuesday. Efren Moreano, 21, of Yonkers, is charged with second-degree manslaughter, first-degree reckless endangerment, second-degree vehicular manslaughter, driving while intoxicated and unlawful possession of marijuana. The incident happened on February 27, 2015, at approximately 3:45 a.m. Prosecutors say Moreano, while behind the wheel of a Honda Civic sedan, drove northbound on to the southbound Jackson Avenue exit of the Sprain Brook and entered the parkway going in the wrong direction. 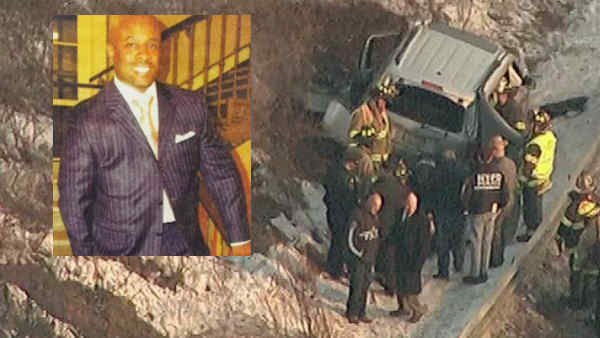 At the same time, the victim, 46-year-old Detective Paul Duncan, of Hartsdale, was driving his Honda Pilot SUV on his way to work at a police precinct in Queens. He entered the Sprain Brook Parkway from the Route 100-B entrance heading south. He was two miles into his commute when authorities say Moreano struck his vehicle head on, killing Duncan instantly. Moreano sustained serious injuries to his right arm and leg and needed to be extricated from his vehicle. He subsequently underwent surgery. During the extrication, emergency responders detected a strong odor of alcohol. Additionally, a New York state trooper smelled marijuana coming from Moreano's car and observed a small bag of marijuana on the passenger side of the car. An accident investigation revealed that Moreano was traveling at approximately 100 miles per hour at the time of the collision, and toxicology results show that he had a blood alcohol level of .16 along with marijuana in his system. He was arrested and remanded to the Westchester County jail without bail, where he has remained since. He is due back in court on November 2, and he faces a maximum sentence of 15 years in state prison if convicted.